Sinking islands may become a reality with sea level rise and climate change in decades to come. 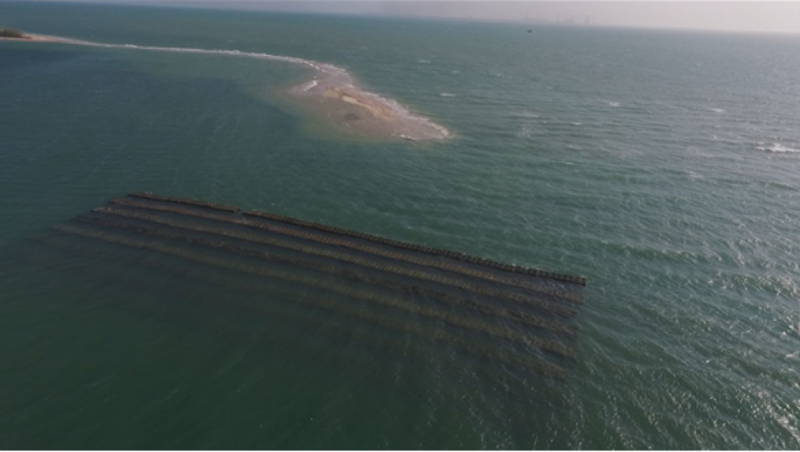 Tamil Nadu has hit upon a novel idea to protect such islands on its coast—deploying artificial reefs near vulnerable islands. Artificial reefs, made of concrete, have been found capable of preventing further erosion of ecologically sensitive islands and regenerating coral biodiversity in the Gulf of Mannar. “We have successfully demonstrated this in Vaan island in the Munnar region. The island which had sunken to a great extent over decades has regained some of its area,” said H Malleshappa, head of the Tamil Nadu State Climate Change Cell. Vaan is one of the 21 islands in the Gulf of Mannar, which was declared a marine biodiversity park in 1986. Indiscriminate mining of coral and destructive fishing practices in past decades have fully submerged two islands. Vaan was on the verge of submergence when the project began in 2015. Its area had been reduced from 16 hectares in 1986 to 2 hectares in 2014. “Following the deployment of artificial reefs, new accretion has occurred,” Malleshappa told India Science Wire on the sidelines of a workshop on climate change. The area of Vaan island has increased by 2.24 hectares in low tide and 1.8 hectare in mean tide between December 2015 and August 2016. The restoration of Vaan island is one the climate adaptation projects funded by the National Adaptation Fund for Climate Change of the Ministry of Environment, Forests and Climate Change. The state has been given Rs 25 crore for the project. It is the first attempt in India to protect and restore a sinking island. Deployment of artificial reefs parallel to the sinking island in the seaward side reduces the effect of currents and waves, enhances fish habitats for higher fish production and protection of fish diversity. Natural corals get attached to artificial reefs over time and start regeneration. Following the success in Vaan, Tamil Nadu has proposed to undertake restoration of two more islands and has approached Green Climate Fund for funding of Rs 100 crore. The first two phases of the project were funded by the TN Coastal Zone Protection Authority, starting in February 2015. The project had two components in these phases—coral rehabilitation and artificial reef deployment. In the first phase, three square kilometre degraded area around the island was rehabilitated with native coral species using standard coral transplantation techniques. Rehabilitated coral sites were monitored regularly to document survival and growth of the transplanted corals. The survival rate is 80 to 90 per cent and spawning has been observed in transplanted corals. The coral rehabilitation project was started with technical expertise from the Suganti Devadason Marine Research Institute. None of the islands are inhabited but they support livelihoods. Therefore, one of the key objectives of the project is to undertake eco-development activities among coastal communities to enhance their adaptive capacity, Malleshappa added.In the second phase, artificial reefs were deployed. For this, the Indian Institute of Technology Madras (IIT-M) conducted wave dynamic and bathymetry studies. Based on this the design was finalised and locations identified for deploying artificial reef modules. Each module is 2.5 meter in width, 2 meter in height and 1 meter in longitudinal length, and weighs 1.8 tonnes. The concrete reefs have been deployed 250 meters from the island in a semi-circular constellation. In the first two phases, 4,600 modules have been deployed in eight months. Now with the funding from Adaptation Fund, the plan is to take the total number of artificial reefs to 10,000 in two layers. Though the reason for erosion of islands is combination of several factors, experts point out that sea level rise due to climate variation is posing additional threat to coastal islands. “Low-lying coastal areas are more vulnerable to impacts of climate change as they are highly prone for inundation due to sea level rise,” observed K Palanivelu, director of the Centre for Climate Change and Adaptation Research at Anna University. "Indiscriminate mining of coral and destructive fishing practices in past decades have fully submerged two islands. Vaan was on the verge of submergence when the project began in 2015." -- how come. It appears that this is a fishy project.